As Ma and Pa Ubu, Emi Aungst and Logan Clingan plot to carry out many despicable deeds in the dark satire, "Ubu Roi." “Ubu Roi”, the iconoclastic play by Alfred Jarry that sparked a riot at its Paris premiere over a century ago, will take to the Little Theater Mainstage starting Oct. 5th as the Post Theatre Company’s ambitious 2018-2019 season gets underway. Jarry’s nihilistic masterwork, written in 1896, is a surreal parody of “Macbeth,” with over-the-top characters, grotesque comedy and bloody massacres perpetrated by Ma and Pa Ubu in their quest for power. It caught audiences so off guard at its December 1896 premiere that it closed the same night it opened after they shouted it down. Here at the Little Theater under the direction of Melanie S. Armer, the production promises to be no less engaging and provocative, but these days, given what’s happened in the world on stage and off, the audience may take their entertainment sitting down, without acting out. Certainly they’re guaranteed a good time—maybe even a laugh riot. 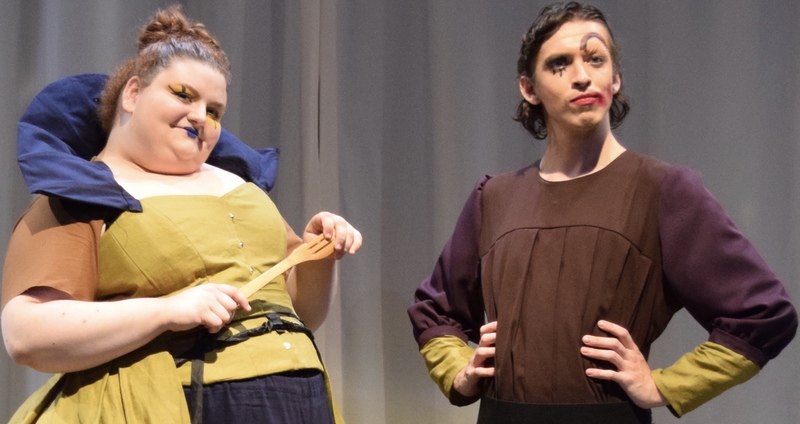 “Working on ‘Ubu’ with the students at LIU Post, I’ve been reminded how infectious and cathartic laughter is,” said Melanie Armer. The Post Theatre Company, a non-for-profit resident theatre company of the Department of Theatre and Dance at LIU Post, is staffed by professional artists and regularly commissions guest artists to work closely with our students. “The company employs professional artists as directors and designers of our productions to provide a bridge for the students between the academic and professional worlds,” said Heather Drastal, general manager of the Post Theatre Company. The company’s creative contribution to the cultural landscape of Long Island was the recent subject of an article in Newsday, which showcased a rehearsal of “Ubu Roi” in progress. “Ubu Roi” runs Oct 5-6th and Oct. 11-13th at 7:30 p.m., with matinees on Oct. 7 and Oct. 14th at 3 p.m.
Next on the calendar are two pieces developed and directed by students that will run in the Rifle Range Laboratory, which is in the same building, starting Oct. 26-27th at 7:30 p.m. and Oct. 28th at 3 p.m. There’s “A Day on Venus,” written and directed by Aaron Cooper, and “Vincent and Us,” an Honors Thesis, devised and directed by Isabelle Reutens. Returning to the Mainstage in November will be “Iphigenia & other Daughters,” written by Ellen McLaughlin and directed by Dina Vovsi, starting Nov. 9-10th and Nov. 15-17th at 7:30 p.m., with matinees at 3 p.m. on Nov. 11th and Nov. 18th. General admission is $15, $12 for seniors and $10 for students. Tickets can be purchased online at tix55.com/ptc700. For more information, call the box office at 516-299-2356 or email post-ptc@liu.edu. The Little Theater is located on Post Road across from the main library at LIU Post, nearest the West Entrance (Tilles Center) off Northern Boulevard (Route 25A).